What Does NRAS Stand For? What Does NRAS Stand For? What does NRAS stand for? NRAS stands for the National Rental Affordability Scheme which is a scheme created by the Australian government to help increase access to affordable housing for people on lower incomes. What does NRAS stand for? NRAS stands for the National Rental Affordability Scheme, which is a scheme created by the Australian government to help increase access to affordable housing for people who are on lower incomes. 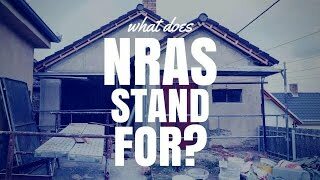 So in this episode, I’m going to go into more detail about what exactly is NRAS? What are the benefits of it to people who are renting? What are the benefits, more specifically, to people who are investing in property and how do we make sense of this NRAS thing? Hi, I’m Ryan from onproperty.com.au, your daily dose of property education and inspiration. And so, NRAS or the National Rental Affordability Scheme has the goal to provide more affordable housing to people, and more specifically to people on that lower end of the income spectrum. And so the main details of the NRA scheme are that it has incentives, so you get incentives for being a part of the scheme. Obviously, otherwise, it wouldn’t be a scheme. The incentives last 10 years. And I’m going to go into detail on the payments that you get. But I’m basically – I’m going to let you know from the outset that this scheme was created in order to encourage large-scale investment in affordable housing. So, it’s actually very hard for private individuals to get access to NRAS scheme unless you are buying a property that has already been developed as part of the NRAS scheme. So, if there’s a property that’s developed by a larger scale developer that’s part of NRAS, you can actually continue on the NRAS when you purchase the property. But if you’re a private individual, you’re just a low-level investor that’s got, you know, 1 or 2 properties and you’re looking at NRAS as an investment strategy, well, the only way for you to do it is really to buy those properties and it’s going to be very difficult for you to develop NRAS properties. So, that is something that you need to consider. If you’re a private individual, chances are this strategy isn’t going to be awesome for you unless you’re looking at buying one of those NRAS properties. But, obviously, speak to a financial adviser because there maybe ways around that or I may have my information incorrect but this is from the research that I’ve done. And, look, it’s very hard to understand government legal jargon and all of this sort of stuff so I’m trying to make it as simple for you guys as possible. Being a part of the NRAS scheme as a property owner means that you need to offer your property at least 20% below market value in terms of the rent that you are charging. Now, the chances of people actually offering below 20% below; you know, like 30% discount, 40%, 50% discount is probably pretty slim because let’s say, like, the government makes that 20% discount a minimum, there’s no financial incentive for you to offer a 50% discount or a 60% discount. So, I think in most cases, it’s just going to be that 20% discount. But, obviously, speak to someone who is a professional and who knows more about this sort of stuff. And if and when you do that, and you’re a part of the scheme, okay, you can’t just do that on any property you own. You’re going to get, at the moment and it changes every year based on inflation or CPI, it’s called. At the moment, as I’m recording this in 2015, you got $7,996 as a refundable tax offset or payment. And the payment is actually for charities that I’ve heard of. So it’s a refundable tax offset. Now, if you want to understand what a refundable tax offset is, that’s very difficult to do because I googled it and what I read didn’t make sense. But my guess, and this is totally an absolute guess, so don’t take this as fact at all, is that a refundable tax offset is tax-free money that you’ll get at the end of the financial year. That’s my guess. Look, I don’t know. I googled it and I read, it was on Wikipedia and look, I’ll link up to it in the article but, yeah, I couldn’t understand what that was. And you’re also going to get, ok so… sorry, that $7,996 is from the commonwealth government, so the Australian government and national government. And you’re also going to get $2,665 per year in financial support from your state or territory government. And that gets paid in September, so, I’m pretty sure that’s just a payment that you get, $2,665. So that’s a total of $10,661 in financial benefits for being a part of this NRAS scheme. So, as I said, it’s to encourage large-scale investments but in order to get access to this scheme, you must rent your dwelling to an eligible person, so someone that is NRAS-approved and that is in the lower income level. You need to rent your property for 10 years but you can exit the scheme when you want. So, if you find that NRAS isn’t working for you, you can actually exit and opt out of the scheme and, obviously, give up those financial benefits that you get. You rent your property for at least 20% below market value. And then what happens is you then get the benefits. So, let’s look at an example because that is the easiest way to make sense of NRAS is to look at an example of an imaginary property that we’re going to invent. Let’s say we own this imaginary property, the value of the property doesn’t actually matter in this case. But let’s say the market for this property is $400 per week. Well, in order to continue with NRAS, we’re going to have to offer that at a 20% discount, so, $320 per week. This means that we’re losing $80 per week in rental income because if we were charging market rate, we’d be getting $80 per week more. So, this means per year, we’re losing $4,160 in potential rental income that we could have got. But the gains, as we discussed, the financial benefits are $10,661. So that’s over $6,000 benefit compared to the rent that you lost. There’s also the benefit that NRAS properties, they say, they’re less likely to go unrented. Because, obviously, a property that’s 20% cheaper than everything else in the market is going to be in higher demand. So, if you own a NRAS property, then you may have lower vacancy rates. And again, I say “may” because even though it may be in higher demand, there’s more hoops for people to jump through and you can only rent it to approved people so you don’t have the entire the entire market that you can rent that property to. So the goal of the NRAS scheme was for large-scale investors to stimulate development and to stimulate growth in housing. And so it’s not really aimed at private individuals in terms of the creation phase but as I said, private individuals can actually purchase an NRAS property and continue on with the scheme. Look, there may be other details out there. You can go out and search for them. As I said, I found a very hard to find good information on this that made a lot of sense. And I think the reason this is, is a lot of people are interested in this but it’s actually the goal of it was for large-scale developments and only now are these large-scale developments being on sold to investors and that’s where all of the interest is. So I hope that this has been a simplified version to help you make sense of NRAS for your situation. The major benefit that I can see is not capital growth; it’s not, you know, in terms of getting equity and things like that. But it’s more it could improve your cash flow because of the benefits that you’re getting from the government. And I was thinking, I was like, NRAS, you know, you’re getting extra $6,000 per year as a property owner. Why not just give that money to lower income earners and give them a higher rental assistance? Because rental assistance is something that already exists, why don’t you just up that to help make housing more affordable and the goal for this was actually for large-scale developments to get more properties developed and to create more affordable housing. So just by giving people who get rental assistance more money, well then we’re actually make more properties and fix this problem. So, I think that goal of NRAS was to fix that problem and whether they’ve done it or not, you know, that’s up for big wigs who are smarter than me in the government to analyze and to decide. But I hope that this has been helpful to you. If cash flow is the reason you’re interested in NRAS properties, then you might want to check out my positive cash flow property listings. You can get access to 10, absolutely free. Just go to onproperty.com.au/free to see those 10 high rental yield properties with a good chance of generating a positive cash flow. So, if that’s why you’re interested in NRAS, then check that out because maybe NRAS is for you, maybe it’s not and maybe you just want to search for high rental yield properties then I can help you out there and you can check that out. So, until next time, stay positive.